Aged 34 Or Older? Then A New Study Says You’re Too Old To Be Shopping At IKEA! Are you in your 20s, early 30s? Recently coupled with someone that “could be the one”? Then you are undoubtedly aware of the hell that is spending most of your weekends traipsing through an IKEA store looking for cheap, laminated, self-erecting furniture. But ever get the feeling (the one-buck hot-dogs, aside) you could possibly be getting too old for all that alan keys stuff and the horror of self-assembly? 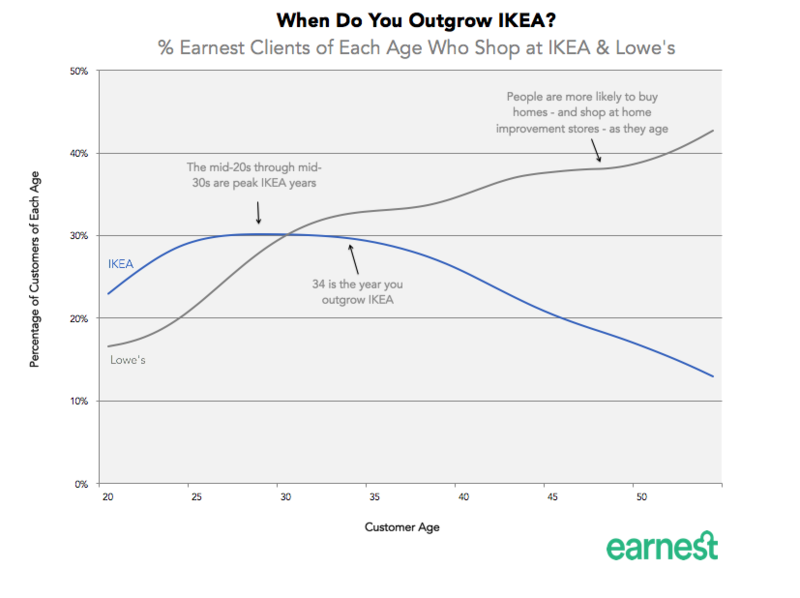 Well, according to a new study it’s fine to shop at the Swedish mega store in your 20s, however, hit the ripe old age of 34 then it’s probably time to take your furniture shopping habits elsewhere. According to the study, by US financial site www.earnest.com, the peak age of the average IKEA shopper is 24 with some 35 per cent of that age group admitting they shopped at the flat-pack retailer. You can read the study’s full results here. As the graph below shows, the interest in shopping at IKEA remains strong throughout shoppers’ 20s, however, it markedly wanes come the mid 30s. The thinking behind the results is that 20-somethings have just moved out of home and want cheap furniture for their first flat share. However, by their mid 30s we’ve all started to have made something of ourselves, we’re starting to nest, possibly bought our own homes and we want more expensive and custom furnishings. According to Earnest, that 10 year period of someone leaving home until their mid 30s is known as the “IKEA decade”. The US website also reviewed 14 other popular American chain furniture stores and found that IKEA was the only one with a mean average shopper age under 30 years of age. When it came to gender, the study found that men and women typically visit the same stores when they go furniture shopping. And they visit IKEA in particularly even numbers. However, it did find blokes had a preference for DIY furniture more so than their female partners.